The first letter to the Corinthians has 2 passages which are clear exhortations to keep running the race and keep the gospel true believers have already received. These passages go directly against the doctrine of Once Saved Always Saved and show that if we don't keep running and if we don't keep in memory the true gospel, we could lose our salvation. In this post, I will display these two passages with some additional comments. Hopefully, dear reader, this will further help you see the truth for yourself. May the Lord guide you to the truth of His gospel! The apostle Paul’s letters to the Corinthians are long and filled with exhortations. In this article, I will only look at two passages which are clear and additional proofs from scripture showing the doctrine of “Once Saved Always Saved” to be false. Please comment below if you have anything constructive to add to this article. The first passage is in chapter 9. Let’s look at it quickly with comments. 25 And every man that striveth for the mastery is temperate in all things. Now they do it to obtain a corruptible crown; but we an incorruptible. (What is that incorruptible crown? Eternal life). 27 But I keep under my body, and bring it into subjection (Paul crucified his flesh during that figurative race): lest that by any means, when I have preached to others, (what did Paul preach? the gospel of salvation through Christ), I myself should be a castaway (other translations say “disqualified” or “disapproved”. From what Paul would be disqualified? from the salvation he is preaching). Dear friends, do you see how Paul used this race analogy to explain how he follows Christ? Why a race? He is talking about a mindset we should have as born-again believers. We are in a race, we should have the mindset to strive hard in order to finish it, we cannot be lazy, sit back and think we are saved. We are to run the race so that we may obtain the crown of eternal life. We all know Paul is born-again (to say the least). He himself brings his body into subjection to keep himself from falling into sin. If he himself endures so that he does not after preaching to others become a castaway, what makes us think we can be different? Anyone with no bias would understand that becoming a “castaway” or “disqualified” means losing salvation. Some OSAS believers have suggested to me that Paul is talking about being only disqualified from preaching, that he is still saved. This is another classic example of twisting scriptures to fit them with a preconceived idea. In context, Paul is talking about a figurative race. He says that we have to finish the race so that we get the incorruptible crown, eternal life. We cannot get that crown until we get to the finish line. It is obvious Paul means he himself could be disqualified from that race if he does not keep under his body, if he doesn’t continue overcoming in Christ. 2 Timothy 4:7 – I have fought the good fight, I have finished the race, I have kept the faith (Paul had to keep the faith to finish the race). This is the second passage in chapter 15 of the same letter. 2 By which (talking about the gospel) also ye are saved (this cannot be any clearer), IF ye keep in memory what I preached unto you, unless ye have believed in vain (they already believed the gospel and are currently saved, if they don’t keep the gospel, they would have believed in vain which clearly implies loss of salvation). Dear friend, I hope this post has convinced you how false and wrong the doctrine of “Once Saved Always Saved” truly is. If it didn’t, please don’t hesitate to add a comment below by using the same letter of 1 Corinthians to back up your position. I don’t like to argue back and forth as I believe it is not what the Spirit wants us to do but if it is a good argument, I will gladly respond if it edifies the body of Christ and helps us grow together. I beg you brothers, whether you believe in this doctrine or not, don’t ever put your salvation in the hands of other men. Search out the scriptures yourself. God has given us His word so that we seek the truth ourselves. Nowadays, there should be no excuse why we should not grab our Bibles and read. Don’t believe other men, don’t believe me, just keep reading the Word until you find the truth. Don’t run the risk of believing in vain, keep your faith until the end, don’t fall back into deliberate sin, don’t lose your incorruptible crown. 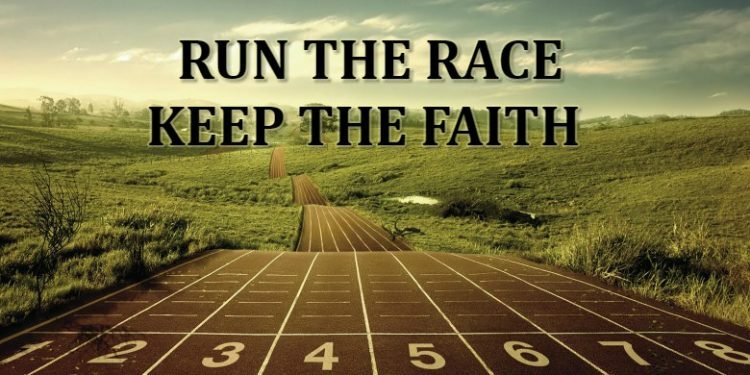 May the Lord give you strength to keep running the race until the end!